In this collage I portray Rumpelstiltskin as an aspect of the wild and randy god Pan, ancient guardian of the wild. We find him here creating the magic that will allow the miller’s daughter to spin the king’s straw into gold. Pan was a god of woodlands and meadows, guardian of both wild animals and flocks with the torso of a man and the hind legs and horns of a goat. His worship spread far and wide spanning a millennium that we know of and probably stretching back far beyond his first archaeological appearance in the 6th century BCE. There is a story from the reign of the Roman Emperor Tiberius (AD 14-37) that purports to report the death of Pan. One day a ship piloted by a sailor named Thamus lay becalmed off the Echinades islands. Suddenly a great voice sounded from the shore. It called his name three times. When he replied the voice shouted, “Tell them that great Pan is dead.” As he sailed along the shore, the pilot shouted to the people on land that the god was dead, whereupon arose the sound of great weeping. The news spread fast and when he arrived in Italy the emperor summoned him to be questioned by a committee of scholars. The learned ones interpreting the event decided that the Pan in question was not the god, but a demon of the same name. Early Christians believed this story and took comfort in it, confident that it marked the beginning of the end of the pagan era, but in fact, well into the 4th century B.C.E. coins were being minted bearing the face of the god. It takes more than a decree to banish a god or to convince people, especially those living close to the land, nature spirits don’t exist. 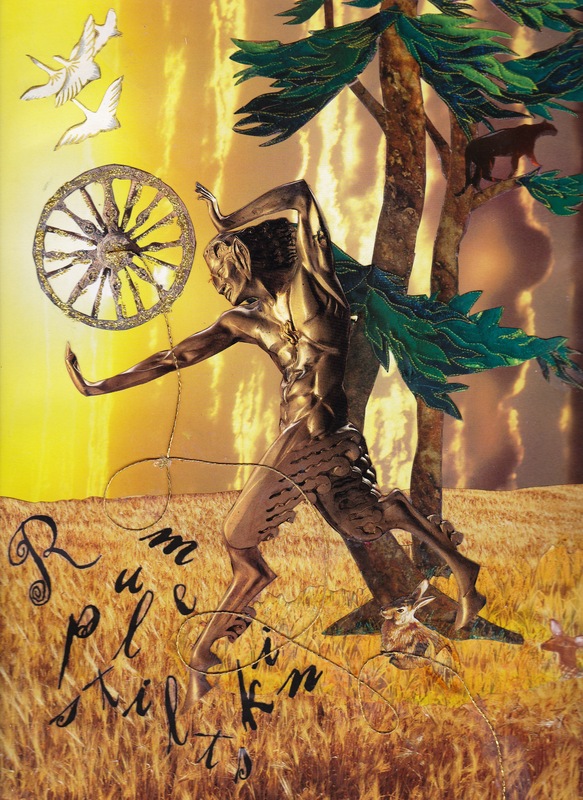 The spirit of Pan lived on in the tales of the fey, the ‘little folk’, fairies, brownies and gnomes and wood sprites such as Rumpelstiltskin. Push them into the shadows as we will, such tales still leak past the borders we set; the lines of logic we impose on both our physical and imaginative landscapes. Maybe, Rumpelstiltskin wanted a child to raise in the old pagan ways and thus ensure their continuation. Perhaps, it is belief that keeps gods alive – maybe they do need someone to clap for them. Thanks to Kenneth Grahame I’ve been a lifelong believer in Pan. 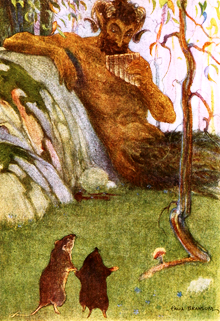 His depiction of the god as the Piper at the Gates of Dawn in his beloved book Wind in the Willows* continues to be the only description of the masculine divine that’s ever truly moved me. In same way that humans cheated Rumpelstiltskin, I think we cheat Nature – the carbon emissions, the methane, the GMO’s, the dams, the pesticides etc., etc., etc. are all ways we break the pact of reciprocity which is part of the evolutionary cycle. It grieves me. It breaks my heart. If I can help restore balance by creating an image of a powerful Earth elemental at the height of his power, I’m glad to do so. It’s the sound of two hands clapping – loud and long.